A new corpus for Spanish Second Language Acquisition Research L. Dominguez, R. Mitchell, M. J. Arche (U. of Southampton), E. Marsden (U. of York), F. Myles. 2 A corpus for L2 Acquisition SLA theory aims to understand the complex mechanisms and conditions behind learner grammars SLA theory aims to understand the complex mechanisms and conditions behind learner grammars Access to good quality data is crucial: learner production data + focused comprehension tasks Access to good quality data is crucial: learner production data + focused comprehension tasks Increasing interest in the creation of electronic learner corpora: Increasing interest in the creation of electronic learner corpora: –sharing data more easily –automatising some aspects of data analysis through the use of software such as concordancers, part of speech taggers, etc. 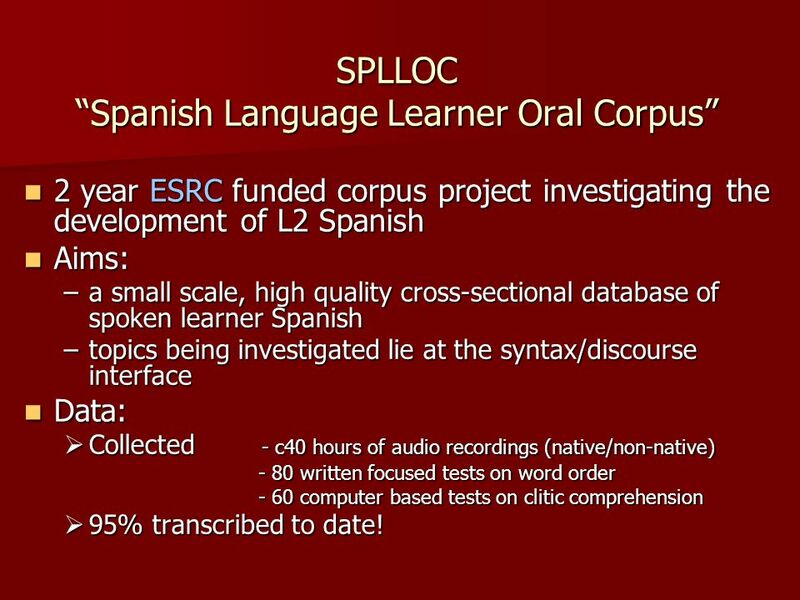 4 SPLLOC “Spanish Language Learner Oral Corpus” 2 year ESRC funded corpus project investigating the development of L2 Spanish 2 year ESRC funded corpus project investigating the development of L2 Spanish Aims: Aims: –a small scale, high quality cross-sectional database of spoken learner Spanish –topics being investigated lie at the syntax/discourse interface Data: Data:  Collected - c40 hours of audio recordings (native/non-native) - 80 written focused tests on word order - 80 written focused tests on word order - 60 computer based tests on clitic comprehension - 60 computer based tests on clitic comprehension  95% transcribed to date! 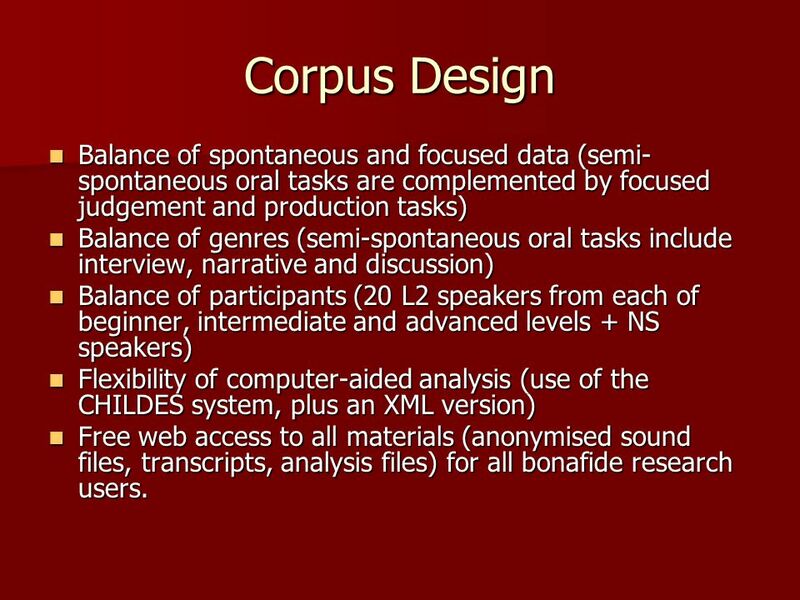 6 Corpus Design Balance of spontaneous and focused data (semi- spontaneous oral tasks are complemented by focused judgement and production tasks) Balance of spontaneous and focused data (semi- spontaneous oral tasks are complemented by focused judgement and production tasks) Balance of genres (semi-spontaneous oral tasks include interview, narrative and discussion) Balance of genres (semi-spontaneous oral tasks include interview, narrative and discussion) Balance of participants (20 L2 speakers from each of beginner, intermediate and advanced levels + NS speakers) Balance of participants (20 L2 speakers from each of beginner, intermediate and advanced levels + NS speakers) Flexibility of computer-aided analysis (use of the CHILDES system, plus an XML version) Flexibility of computer-aided analysis (use of the CHILDES system, plus an XML version) Free web access to all materials (anonymised sound files, transcripts, analysis files) for all bonafide research users. 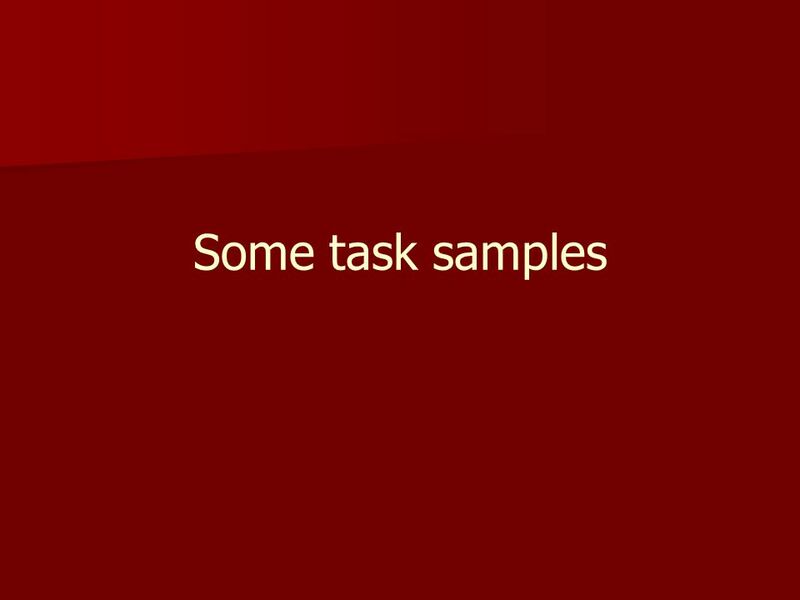 Free web access to all materials (anonymised sound files, transcripts, analysis files) for all bonafide research users. 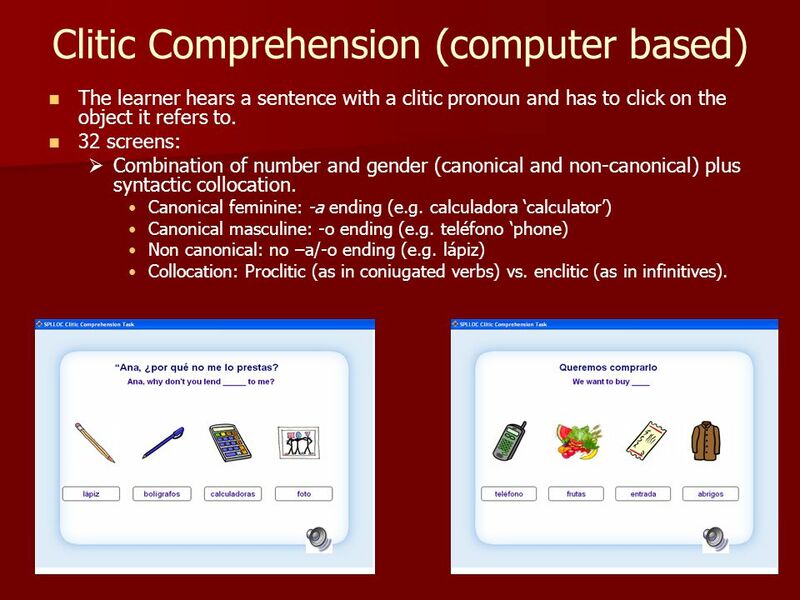 13 Clitic Comprehension (computer based) The learner hears a sentence with a clitic pronoun and has to click on the object it refers to. 32 screens:   Combination of number and gender (canonical and non-canonical) plus syntactic collocation. Canonical feminine: -a ending (e.g. calculadora ‘calculator’) Canonical masculine: -o ending (e.g. teléfono ‘phone) Non canonical: no –a/-o ending (e.g. lápiz) Collocation: Proclitic (as in coniugated verbs) vs. enclitic (as in infinitives). 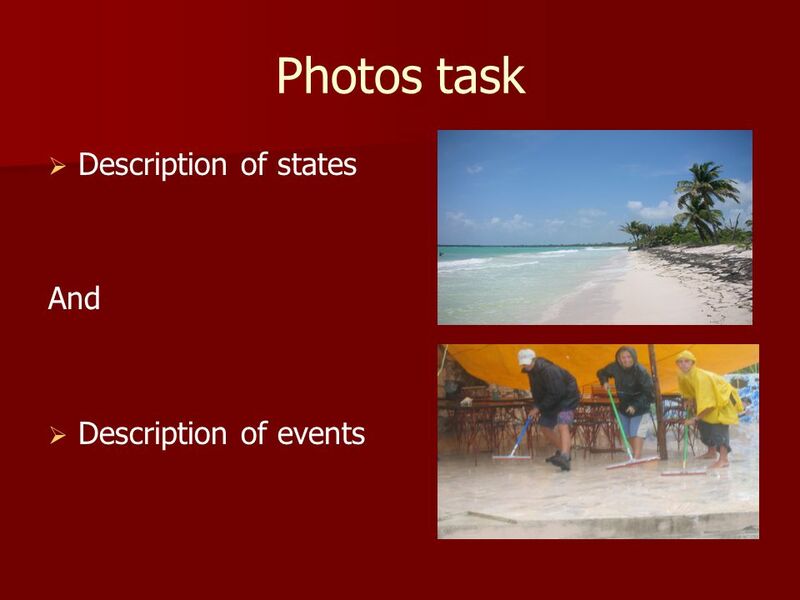 14 Clitic Production (computer based) The learner is asked a question referring to an object based on the sequence of pictures shown. 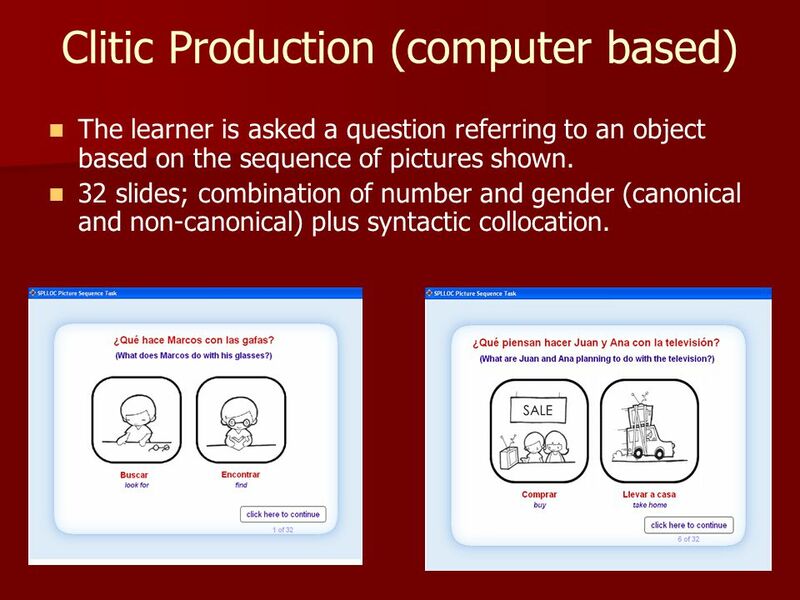 32 slides; combination of number and gender (canonical and non-canonical) plus syntactic collocation. 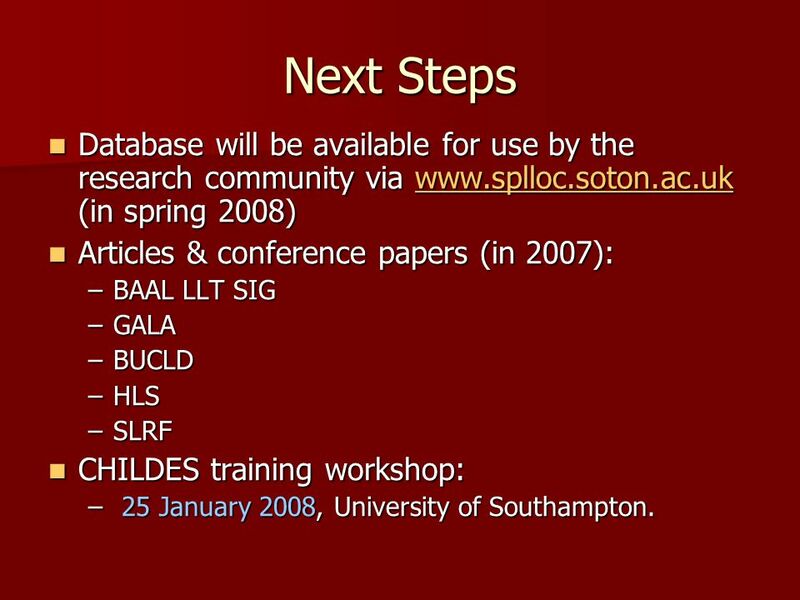 18 Next Steps Database will be available for use by the research community via www.splloc.soton.ac.uk (in spring 2008) Database will be available for use by the research community via www.splloc.soton.ac.uk (in spring 2008)www.splloc.soton.ac.uk Articles & conference papers (in 2007): Articles & conference papers (in 2007): –BAAL LLT SIG –GALA –BUCLD –HLS –SLRF CHILDES training workshop: CHILDES training workshop: – 25 January 2008, University of Southampton. 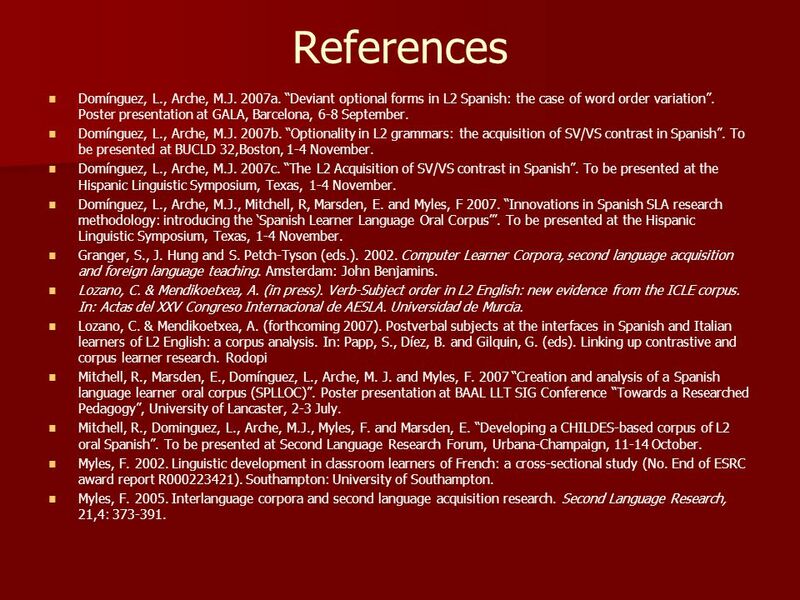 20 References Domínguez, L., Arche, M.J. 2007a. 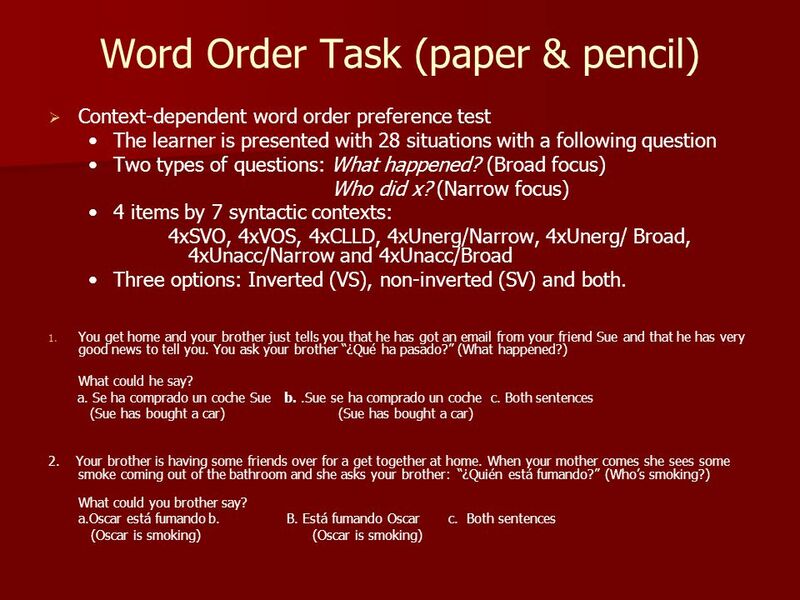 “Deviant optional forms in L2 Spanish: the case of word order variation”. Poster presentation at GALA, Barcelona, 6-8 September. Domínguez, L., Arche, M.J. 2007b. “Optionality in L2 grammars: the acquisition of SV/VS contrast in Spanish”. To be presented at BUCLD 32,Boston, 1-4 November. Domínguez, L., Arche, M.J. 2007c. “The L2 Acquisition of SV/VS contrast in Spanish”. To be presented at the Hispanic Linguistic Symposium, Texas, 1-4 November. Domínguez, L., Arche, M.J., Mitchell, R, Marsden, E. and Myles, F 2007. “Innovations in Spanish SLA research methodology: introducing the ‘Spanish Learner Language Oral Corpus’”. To be presented at the Hispanic Linguistic Symposium, Texas, 1-4 November. Granger, S., J. Hung and S. Petch-Tyson (eds.). 2002. 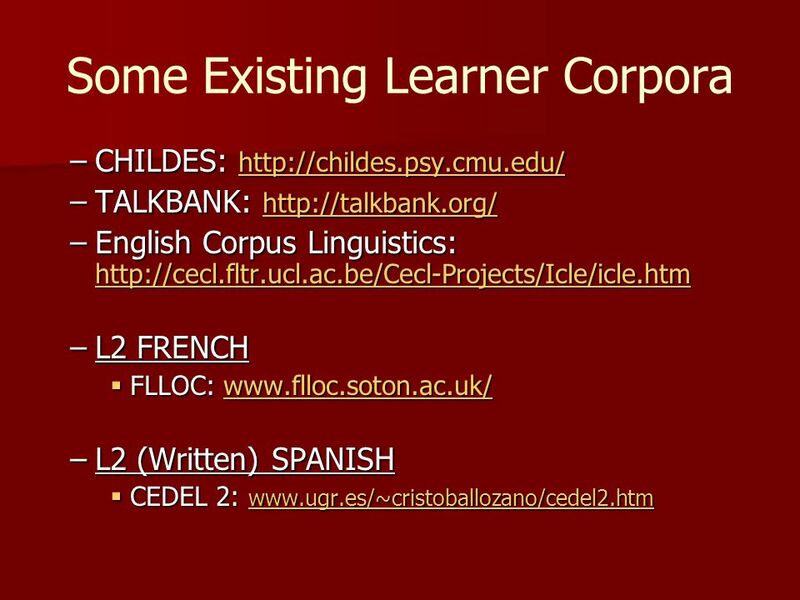 Computer Learner Corpora, second language acquisition and foreign language teaching. Amsterdam: John Benjamins. Lozano, C. & Mendikoetxea, A. (in press). Verb-Subject order in L2 English: new evidence from the ICLE corpus. In: Actas del XXV Congreso Internacional de AESLA. Universidad de Murcia. Lozano, C. & Mendikoetxea, A. (forthcoming 2007). Postverbal subjects at the interfaces in Spanish and Italian learners of L2 English: a corpus analysis. In: Papp, S., Díez, B. and Gilquin, G. (eds). Linking up contrastive and corpus learner research. Rodopi Mitchell, R., Marsden, E., Domínguez, L., Arche, M. J. and Myles, F. 2007 “Creation and analysis of a Spanish language learner oral corpus (SPLLOC)”. 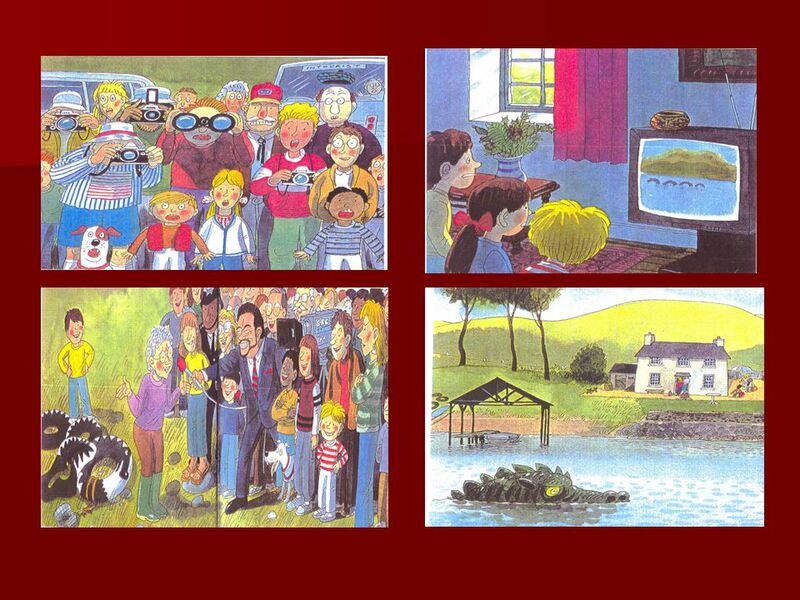 Poster presentation at BAAL LLT SIG Conference “Towards a Researched Pedagogy”, University of Lancaster, 2-3 July. Mitchell, R., Dominguez, L., Arche, M.J., Myles, F. and Marsden, E. “Developing a CHILDES-based corpus of L2 oral Spanish”. 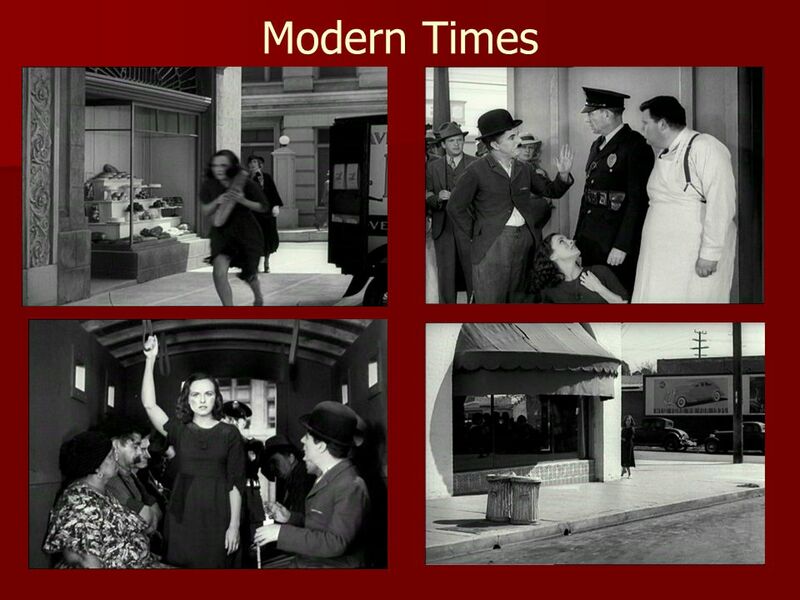 To be presented at Second Language Research Forum, Urbana-Champaign, 11-14 October. Myles, F. 2002. 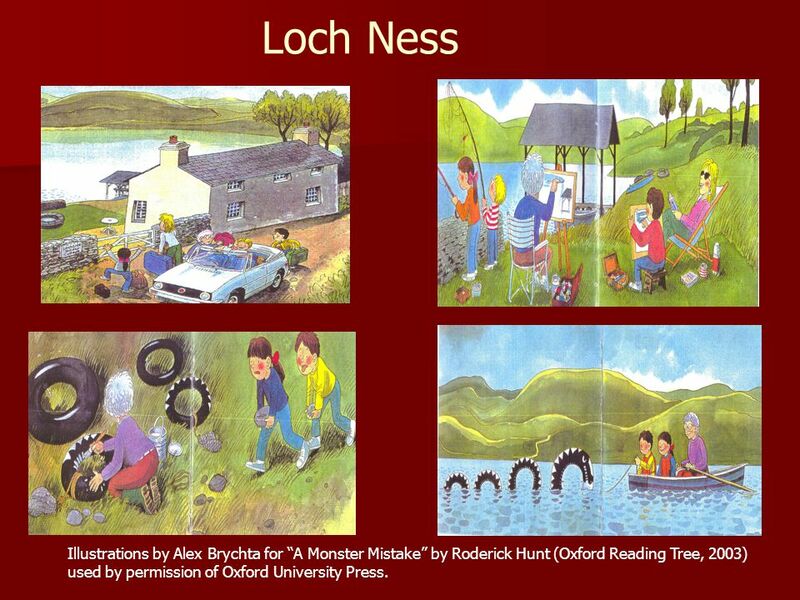 Linguistic development in classroom learners of French: a cross-sectional study (No. 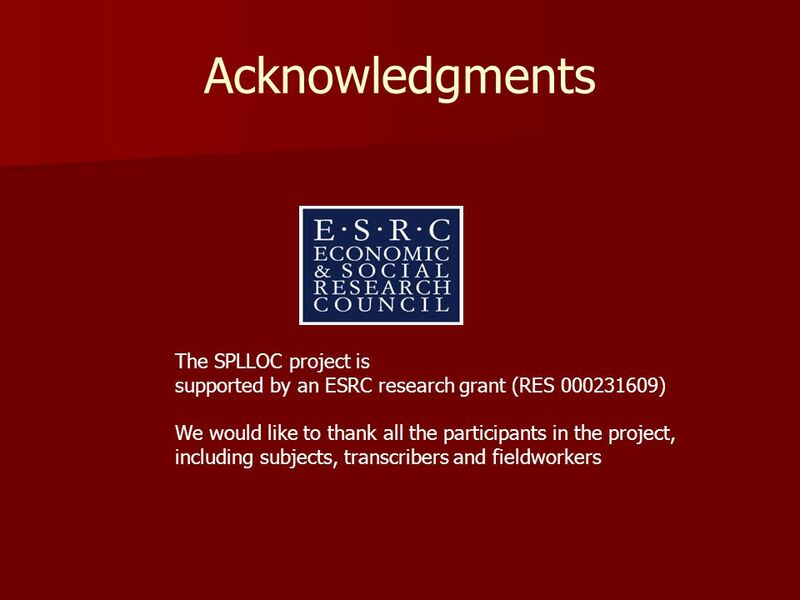 End of ESRC award report R000223421). Southampton: University of Southampton. Myles, F. 2005. Interlanguage corpora and second language acquisition research. Second Language Research, 21,4: 373-391. 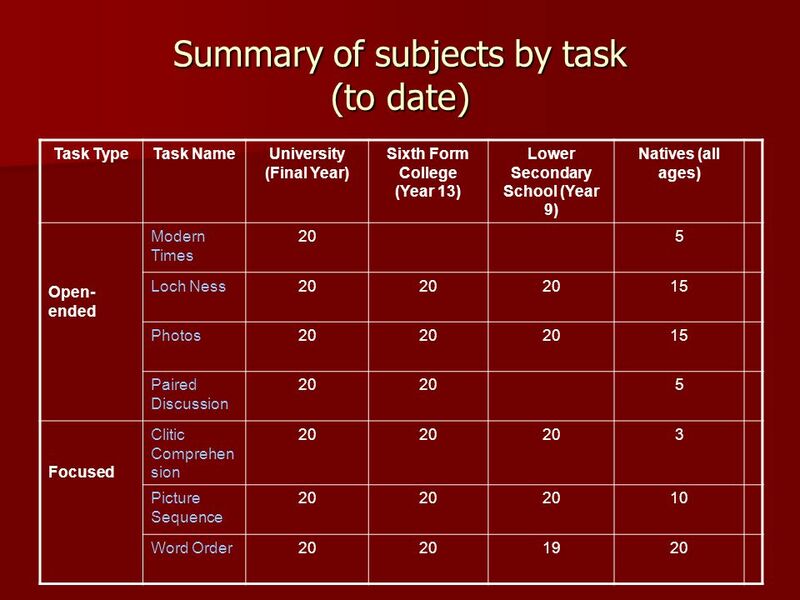 Download ppt "A new corpus for Spanish Second Language Acquisition Research L. Dominguez, R. Mitchell, M. J. Arche (U. of Southampton), E. Marsden (U. of York), F. Myles." Making the most of assessment: designing multi-purpose tasks for young language learners Louise Courtney Warsaw 21st October 2011. IRCS Workshop on Open Language Archives IMDI & Endangered Languages Archives Heidi Johnson / AILLA. Table of Contents – Part B HINARI Resources –Clinical Evidence –Cochrane Library –EBM Guidelines –BMJ Practice –HINARI EBM Journals. ESDS Qualidata: Qualitative Data Preparation and Use John Southall ESDS 26 November 2003. ESDS Qualidata Libby Bishop, ESDS Qualidata Economic and Social Data Service UK Data Archive ESDS Awareness Day Friday 5 December 2003Royal Statistical. 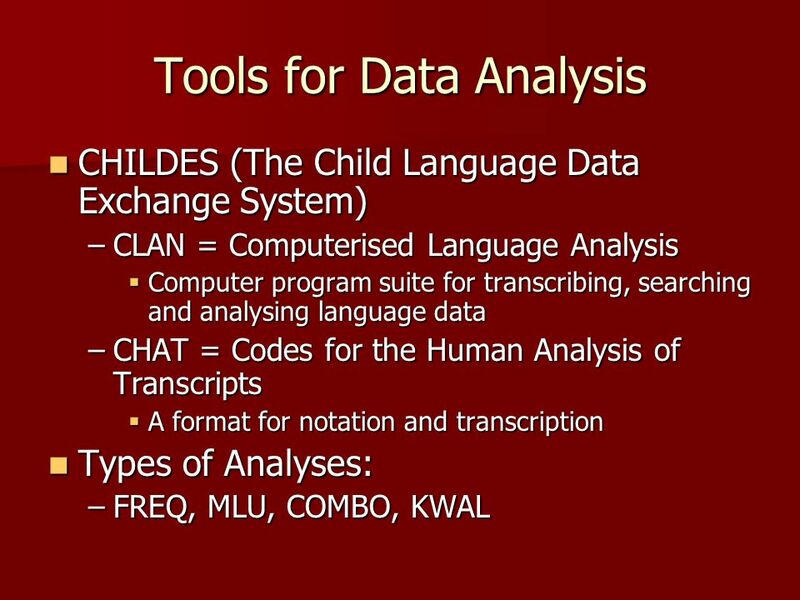 CLL Session 3: L2 Research Methodology LAEL, Lancaster University Florencia Franceschina. 1 Teaching writing: Issues from a British perspective Clare Furneaux The University of Reading, UK Oficinas de Escrita no Ensino de Línguas, Universidade. By: Nane Magdalena / Acquisition of Communicative Competence Competence and Use Academic vs. Interpersonal Competence Competence of Language. CRELLA University of Bedfordshire May 2012 Parvaneh Tavakoli Effects of Task Design on Native and Non-native Task Performance. A tool for simplifying text For people with autism who have difficulty with understanding regular text Converts. 1 Exploring register variation in learner lexis The high-frequency verb make in native and learner speech and writing Claire Hugon CECL Louvain-la-Neuve. A Critical Analysis of English Language Courses in Thailand Richard Watson Todd King Mongkut’s University of Technology Thonburi ©2009 Richard Watson Todd. 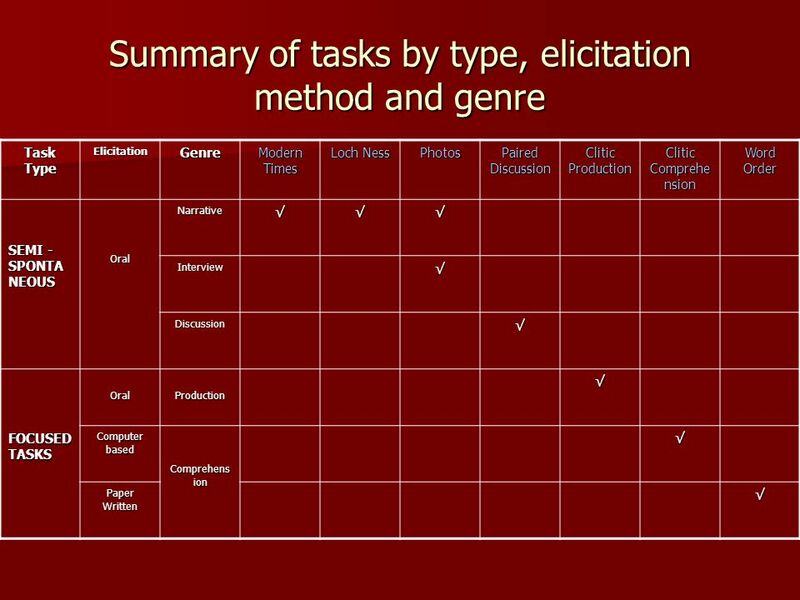 Using corpora in SLA research: investigating word order Universidad Autónoma de Madrid WOSLAC project: 2 learner corpora CEDEL2WriCLE. 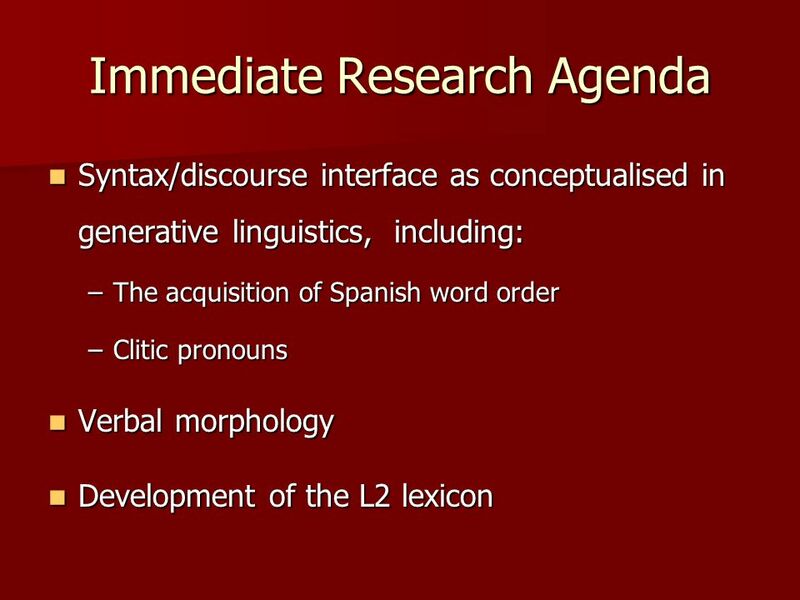 Corpus Linguistics and Second Language Acquisition – The use of ACORN in the teaching of Spanish Grammar Guadalupe Ruiz Yepes. ”When CALL is the better choice” Jane Vinther, Ph.D. University of Southern Denmark CALL 2008 conference University. Current Trends in Language Documentation and the Hans Rausing Endangered Languages Project Lenore A. Grenoble Dartmouth College Lenore A. Grenoble Linguistics.